The destruction caused by air strikes in the city of Al-Raqqah (from a video distributed by ISIS, December 20, 2014). 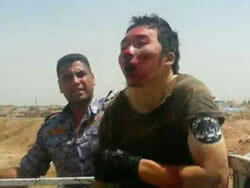 Foreign suicide bombers deployed in the city of Ramadi during the fighting. ISIS’s new Penal Code, published in the province of Aleppo (Twitter account associated with ISIS, December 19, 2014). In Syria and Iraq, ISIS continued fighting in the various battle zones. In Iraq, ISIS recorded successes in areas north of Baghdad (the oil city of Baiji, areas south of the city of Samarra) and in the Sunni province of Al-Anbar (in the city of Ramadi, the provincial capital). In Syria, theKurds were successful in battles in the city of Kobani, and ISIS made another unsuccessful attempt to take over the military airfield in the province of Deir al-Zor. On the other hand, ISIS’s rival, the Al-Nusra Front, was successful in the province of Idlib, in western Syria (occupying two large Syrian Army bases) and consolidated its influence in this province. In southern Syria, violent conflicts continued between the rebel groups. These conflicts are exploited by ISIS in an attempt to establish a foothold in this area, where the Al-Nusra Front is the dominant organization. This week, in France, there was a shooting attack (at a Jewish synagogue in Paris) and stabbing and vehicular attacks. The circumstances of each of these attacks and their connection to terrorism are still unclear and are under investigation. The French authorities claim that at least in the two vehicular attacks, any connection with terrorism has been ruled out. However, in the ITIC’s assessment, some of the incidents in France (the stabbing attack, for example) may be a response by local Muslims to repeated calls by ISIS to harm French as well as other Western civilians. The ITIC believes that the incidents in France are part of a wave of attacks carried out in recent months by local Muslims (individuals, in most cases) who were inspired by ISIS to launch attacks in Australia, Canada and other Western countries that have joined the campaign against ISIS. The Central Command of the US Army (CENTCOM) reported that during the week, the coalition forces led by the US carried out a few dozen attacks in Syria and Iraq. In Syria, air strikes were centered on Kobani, Al-Raqqah and Abu Kamal. ISIS operatives, buildings, logistics facilities, battle positions and vehicles were attacked in the air strikes. In Iraq, dozens of attacks were carried out in western and northern provinces to assist the Iraqi Army and the Kurdish forces. The attacks, carried out in areas of Mosul, Tal Afar, Sinjar, Fallujah, Al-Qaim and Ramadi, destroyed bridges, vehicles, heavy machinery, battle positions, warehouses and equipment belonging to ISIS. A spokesman for the US Department of Defense announced that 1,300 American soldiers will be deployed throughout Iraq by the end of January 2015, to train, advise and assist the Iraqi security forces. This is in accordance with the approval granted by President Obama on November 7, 2014, to send 1,500 more US troops to Iraq. According to Martin Dempsey, chairman of the Joint Chiefs of Staff of the US Army, attacks by the coalition in Iraq led to the deaths of three senior ISIS operatives. According to him, this has impaired the command and control capabilities of ISIS in Iraq. Dempsey said that in early December 2014,Abu Muslim al-Turkmani, AKA Haji Mutazz, was killed. He was the deputy and right hand man of Abu Bakr al-Baghdadi and the military commander in the Islamic State. Also killed was Abd al-Basit, head of ISIS military operations in Iraq. Another attack, which took place at the end of November 2014, killed Radwan Taleb al-Hamdouni, who served as ISIS’s governor in Mosul (abcnews.go.com, December 18, 2014). The principal conflict arena between ISIS and the Kurdish militias is still the city of Kobani and the Kurdish region that surrounds it. During the week, heavy battles continued between Kurdish forces and ISIS. Nawaf Khalil, spokesman for the Kurdish Democratic Union Party, said that on December 20, 2014, Kurdish fighters managed to take over six neighborhoods in the city of Kobani (Fox News, December 20, 2014). It was reported that ISIS forces lost several dozen operatives during the fighting. At the end of July 2012, the YPG’s Kurdish militias took over Kobani, which the Kurds consider part of Syrian Kurdistan. ISIS, however, strives to impose its control over the Kurdish region surrounding Kobani and control the border area between Syria and Turkey. The battles in Kobani are still ongoing. This week as well, ISIS continued its efforts to take over the military airfield in the province of Deir al-Zor, the major stronghold of the Syrian Army in the east of the country. At this point, the battles are still ongoing. According to reports, several dozen ISIS operatives, including operatives from Morocco, were killed this week in the area of the airfield. 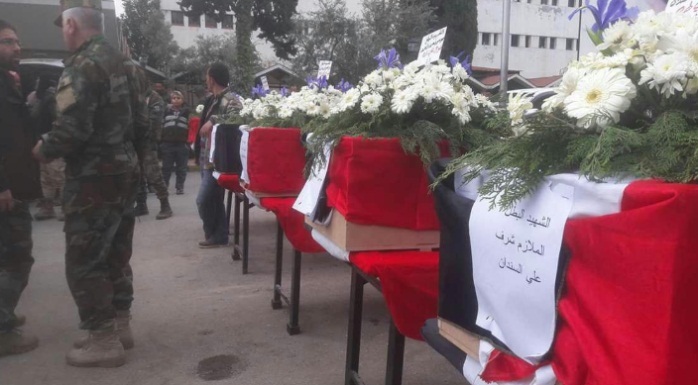 Five of them were killed in an attack on a house located in the southeast of the airfield and 11 were killed in air strikes by the Syrian Army. 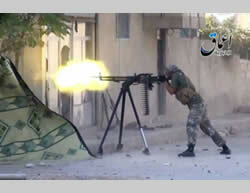 In addition, eight Syrian Army soldiers were killed in the fighting, including the commander of the airfield. 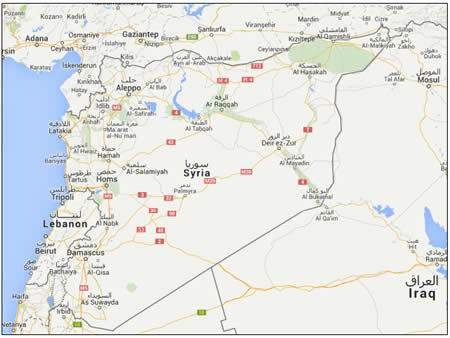 It was reported that Iran has airlifted military supplies to the Syrian Army in the area, and that the Iranian aircraft landed at the airfield at night for fear of becoming a target for ISIS operatives (Syriahr.com, December 22, 2014). Syrian Army, along with the US and the coalition forces, carried out air strikes this week against ISIS’s infrastructure in the “capital city” of Al-Raqqah, in northern Syria (Facebook page of the province of Al-Raqqah of the Islamic State, December 20, 2014). Production and distribution of some 14 tons of flour. Operation of a telephone switchboard in the post office building in the city of Al-Raqqah. Supervision of the electricity grid in the city, including making improvements and repairs. Operation of cleaning services and public transportation in the city. ISIS was able to establish a governmental center in the city of Al-Raqqah. ISIS provides the residents of Al-Raqqah with most of the services that enable them to maintain the routine of daily life (water, electricity, fuel, education). It controls prices, regulates commercial activity and enforces Islamic law (Sharia) with an iron fist and in brutal ways. The ITIC assesses that, at this stage, air strikes havefailed to undermine ISIS’s control of the city of Al-Raqqah and the province as a whole. After months of fierce battles, the Al-Nusra Front, Al-Qaeda’s branch in Syria, captured two large Syrian Army bases near the villages of Wadi al-Deif and al-Hamidiya, in the province of Idlib in northwest Syria. Operatives of the Al-Nusra Front, in collaboration with other rebel groups (including Ahrar al-Sham), managed to take control of the two bases, causing many losses to the Syrian Army. 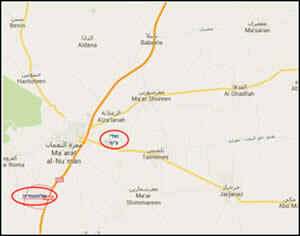 Around 100 Syrian soldiers were taken prisoner in the fighting. During the fighting in Wadi al-Deif, a large quantity of fuel that was at the base (about 35 tanks) fell into the hands of the Al-Nusra Front, along with 20 armored vehicles equipped with ammunition and 1,500 tank shells (News.xinhuanet.com, December 20, 2014). By capturing these two bases, the Al-Nusra Front and its allies took over areas close to the main route between Damascus-Homs-Hama-Aleppo. This enables the Al-Nusra Front and its partners to disrupt the traffic on this important route and possibly cut it off. In addition, capturing these bases establishes the status of the Al-Nusra Front and other rebel groups in the rural area of the province of Idlib, from where they can threaten the cities of Idlib in the west and Hama in the south. Abu Bader, a spokesman for the Ahrar al-Sham rebel organization, a key partner of the Al-Nusra Front in taking over the bases, said that the takeover of the Syrian Army’s Wadi al-Deif and al-Hamidiya army camps is of great strategic importance. He said that this is because these camps are spread out over large areas, from where the rebels could take over additional areas. He said that the Ahrar al-Sham organization initially decided to participate in the fighting alone, but some 10 days ago, representatives of the Al-Nusra Front came to the battle zone, asked to join them, and they accepted the offer (Al-Jazeera, December 15, 2014). Ahrar al-Sham is a framework the size of a brigade, made up of Islamic units which joined forces to fight against the Assad regime. This is one of the largest units after the Free Syrian Army, fighting against the Syrian regime. According to US open-source intelligence, this framework includes several Al-Qaeda members who were released from prison by the Syrian government, some of whom hold senior positions in it. The violent conflicts among the rebel groups in southern Syria are continuing and reaching the point of violent incidents. The key issue is the rivalry between the Al-Nusra Front and Liwa Shuhada al-Yarmouk (i.e., Al-Yarmouk Martyrs Brigade). On December 19, 2014, Liwa Shuhada al-Yarmouk operatives attempted to assassinate one of the commanders of the Al-Nusra Front in the Daraa province by means of an IED attached to his car. The commander and his son were injured in the explosion of the IED (Twitter account associated with the Al-Nusra Front, December 19, 2014). Against the background of these conflicts, ISIS joined forces with Liwa Shuhada al-Yarmouk and persuaded the organization to pledge allegiance to ISIS’s leader. Thus ISIS managed to gain a foothold in southern Syria, an area where the Al-Nusra Front is the dominant rebel organization. This week, the fighting continued between the rebel groups and Syrian Army forces in the southern Syrian Golan Heights. The Al-Nusra Front carried out a suicide bombing attack using a car bomb against Syrian Army soldiers in Sheikh Maskin. 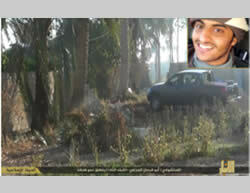 Photos of the vehicle used by the Al-Nusra Front’s operatives to carry out the suicide bombing attack, uploaded to Twitter,indicate that is a vehicle of the type used by the UN forces that operated in the Golan Heights (Twitter account associated with the Al-Nusra Front, December 7, 2014). Left: A vehicle used by the Al-Nusra Front in the suicide bombing attack against soldiers of the Assad regime in Sheikh Maskin. The United Nations insignia is clearly visible on the vehicle on the left (Twitter account associated with the Al-Nusra Front, December 7, 2014). Right: The vehicle after the attack (Twitter account associated with the Al-Nusra Front, December 19, 2014). UN vehicles have been captured in the past by the Al-Nusra Front, which uses them in operations against the Syrian regime (utilizing them for suicide bombings). It is possible that in the future, UN vehicles will be used for attacks against Israel as well. On December 18, 2014, it was reported that ISIS operatives took over the city of Baiji, north of Baghdad, after the Iraqi Army had ordered its soldiers to withdraw from the city and secure only the area of the refineries. 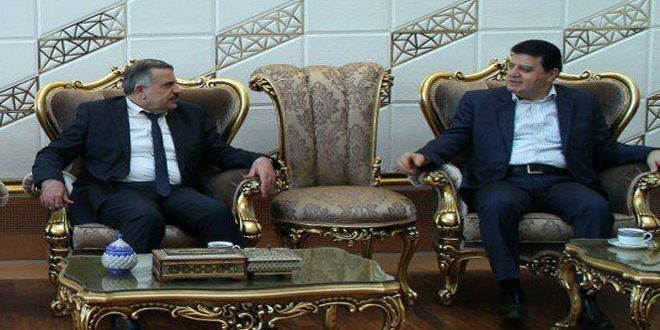 The city of Baiji was taken over again approximately a month later, when the Iraqi Army and tribal militias managed to regain control of the city. Left: Fighting in Baiji (from a Twitter account associated with ISIS, December 21, 2014) Right: ISIS Operatives on an Iraqi tank in Baiji (YouTube, December 18, 2014). This week, ISIS’s efforts to cleanse the pockets of resistance in areas north and west of Baghdad continued. One battle zone was the Shiite city of Samarra, north of Baghdad, which is defended by the Iraqi Army and Shiite militias. 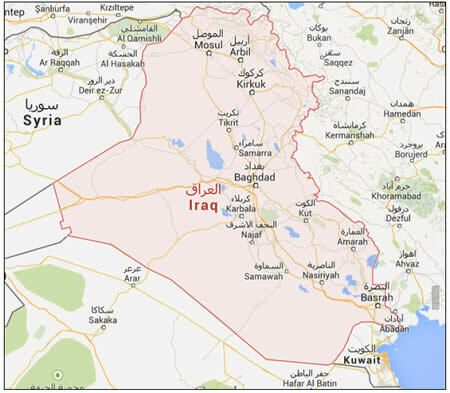 It was reported that ISIS managed to take over areas south of the city of Samarra (Al-Jazeera, December 21, 2014). ISIS posted photos of the recent fighting in Ramadi, the capital of the Sunni province of Al-Anbar. The photos uploaded to Twitter show two foreign suicide bombers, one Tunisian and the other Saudi (Abu Abdallah al-Tunisi and Abu Farhan al-Jazrawi). The attacks in the city of Ramadi resumed on November 21, 2014, after ISIS managed to take over most of the area of the city. In the city, ISIS operatives attacked mainly police stations and government buildings (Al-Jazeera, December 21, 2014). Deploying suicide bombers in Iraq and Syria is a pattern of operation that has become a trademark of ISIS and the Al-Nusra Front. ISIS uses suicide bombings along with ground fighting to increase its effectiveness in both the military level and its battle for hearts and minds. Most of the suicide bombers are foreigners, mainly from the Arab world. On December 17, 2014, Kurdish Peshmerga forces, joined by Yazidi operatives, commenced a campaign to regain control of the area of Sinjar, west of Mosul, which is controlled by ISIS. The ground operation by the Peshmerga forces, which attacked in two locations, was accompanied by coalition forces air strikes. The Kurdish forces managed to regain control of a number of neighborhoods and villages east of the city of Sinjar. According to the Kurds, most of the area of Sinjar is now under their control (Reuters, December 21, 2014). Left: Posting from a Twitter account associated with ISIS from December 21, 2014, claiming that the whole city of Sinjar is in ISIS’s hands. Right: Kurdish takeover of various places in the area of Sinjar (Facebook page of the Kurdish Peshmerga Forces, December 21, 2014). On the evening of December 12, 2014, an IED was detonated at the French Cultural Center in Gaza City. On December 18, 2014, a Salafist-jihadi network in the Gaza Strip by the name of Jund Ansar Allah published a video claiming responsibility for the explosion at the French Cultural Center. According to the video, the attack was in response to the operations against ISIS by the coalition, in which France is also a key partner. The video emphasized that the attack was carried out despite the fact that the area where the Cultural Center is located is surrounded by headquarters of the Hamas security forces. On August 14, 2009, Hamas used military force to suppress the Jund Ansar Allah (Army of Allah's Supporters) network, which is affiliated with the global jihad. In clashes that took place in the mosque of Sheikh Al-Islam Ibn Taymiyyah in Rafah and nearby, 24 people were killed, around 130 were injured and a few hundred suspects were arrested, including Salafist-jihadi operatives. The dead included Sheikh Abu Nur al-Maqdisi (a religious-ideological authority of the Salafist-jihadi networks) and Khaled Banat, AKA Abu Abdallah al-Suri (the military leader of Jund Ansar Allah). During the clashes, Hamas forces did not hesitate to shoot at a mosque bearing the name of Sheikh al-Islam Ibn Taymiyyah, a prominent Islamic icon, causing significant damage. 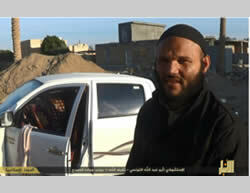 On December 20, 2014, a Hamas forum reported the death in Iraq of Mumtaz al-Wahidi, 27, from the town of Al-Zahra, south of Gaza City, after he had joined the ranks of ISIS (Hamas forum, December 20, 2014). It was reported that he was killed during an attack by ISIS against an Iraqi military position in the northern part of the Nineveh province (Sama, December 20, 2014). 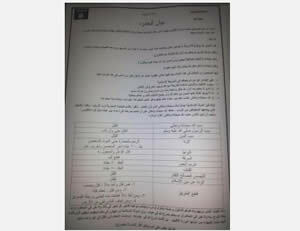 As part of its efforts to consolidate its rule in the province of Aleppo, ISIS has publisheda new penal code. The penalties include: flogging of 80 lashes for drinking alcoholic beverages; the death penalty for collaborators; the death penalty for prostitution and homosexual activity; the death penalty for abandoning the Muslim faith (Twitter account associated with ISIS, December 19, 2014). It was also reported that ISIS ordered businessmen and factory owners in the Aleppo area to pay 2.5% of their profits as zakat (one of the main precepts of Islam requires every Muslim to donate part of his money to charity). The payment will be transferred to the zakat office of the Islamic State, which will be responsible for the distribution of charity to the needy (syriahr.com, December 21, 2014). An 18-year-old British citizen, apparently from London, known as Umm Khattab, the widow of an ISIS operative who fought in Syria, posted a photo on Twitter of a young boy armed with a toy gun standing in front of an ISIS flag with the inscription “the next generation”. ISIS and its supporters around the world publish photos of children carrying weapons against the background of ISIS flags, to emphasize their determination to fight and their patience. 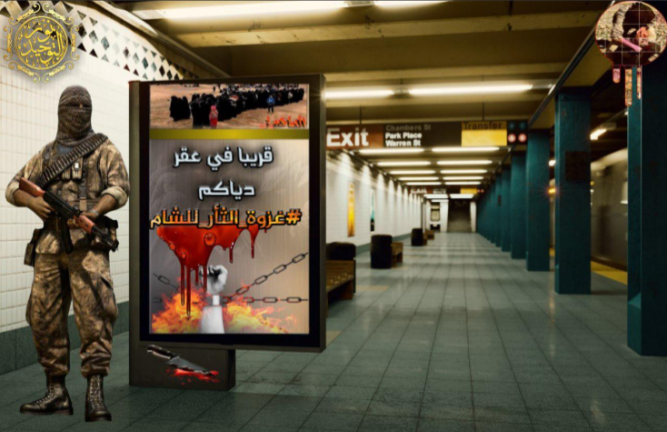 A group by the name of “Raqqa is Being Slaughtered Silently” operates on social networks in order to expose the crimes committed by ISIS in the city of Al-Raqqah in Syria. The group publishes information in English and Arabic,and recently exposed a cyber-attack by elements affiliated with ISIS. It was reported that an organization by the name of The Citizen Lab, which deals with cyber security, has found malware intended to harm the group. In the ITIC’s assessment, the cyber-attack, assuming it was carried out by ISIS or its supporters, may be an indication of ISIS’s efforts to prevent the exposure of crimes carried out in the areas under its control. On December 20, 2014, a man carrying a knife broke into the police station in Joué-lès-Tours (a suburb of the city of Tours, in central France), shouted "Allahu Akbar" and attacked the police. Three policemen were injured. The attacker was shot and killed. The attacker was Bertrand Nzohabonayo, 20, a native of Burundi, known to the police because of minor crimes that he committed. His brother is known to the security services as holding extremist Islamic views and as having considered going to fight in Syria. Around two days before carrying out the attack, the attacker uploaded an ISIS flag on Facebook. On the other hand, it was reported that the attacker was a member of a social network that has come out against ISIS (Rawstory.com, December 21, 2014). On December 21, 2014, aman in Dijon (eastern France) ran over 11 policemen, critically injuring two of them. The man shouted “Allahu Akbar” when he hit the policemen. Immediately after the attack, the driver was arrested, but two passengers who were with him in the vehicle managed to escape. According to media reports, the detainee was born in 1974 and is apparently deranged (Al-Jazeera, December 21, 2014). One day later, on December 22, a driver charged into a crowded Christmas market in the city of Nantes, in western France. At least 17 people were run over and one of them died of his injuries. On the night of December 22, 2014, shots were fired at the David Ben Ichay Synagogue in Paris’s 19th Arrondissement. According to the French authorities, there is no connection between these incidents and at least with regard to the vehicular attacks, any affiliation with terrorism has been ruled out. On the other hand, terrorism is suspected with regard to the stabbing. At this stage, the circumstances of these incidents are still unclear, and it is not yet possible to prove a direct link between them and ISIS. However, the ITIC assesses that some of these incidents are cases of Muslims responding to ISIS’s repeated calls to harm French civilians and citizens of other Western countries that are participating in the campaign against ISIS. It should be emphasized that ISIS’s calls to harm Western civilians explicitly mentioned France. A recent example can be found in an ISIS video posted on YouTube on December 19, 2014. The video shows a French speaker (with Arabic subtitles) calling on Muslims in France to attack targets in the country: “To my brothers and sisters in France, as you were called on by the Emir of the Faithful, Abu Bakr al-Baghdadi, to harm the interests of the infidels in their lands […] If the infidels prevent you from emigrating [to the Islamic State], fight them. Today you have a chance to attack them in their homes […]"
Australian police identified the person who carried out the terrorist attack in the café as Haron Monis, AKA Sheikh Haron, a 50-year-old Iranian who received political asylum in Australia in 1996. He served as a Sunni preacher on behalf of himself and was rejected by the Sunni and Shiite communities in Sydney. He was known to the police after several charges had been filed against him. In 2013, he was charged with murdering his ex-wife, as well as over 40 sexual offenses. He denied the charges against him, claiming that they were filed for political reasons (www.bbc.com, December 16, 2014). On his website (which has been removed from the internet), he wrote a month ago that he had pledged allegiance to ISIS and given up his Shiite heritage. Among other things, he wrote that he had the honor to pledge allegiance to the Imam and the contemporary Caliphate (this is a reference to the Islamic Caliphate established by ISIS). His website was also full of articles against the government of Australia and its involvement in the war in Iraq and Afghanistan (Fox News, December 15, 2014). 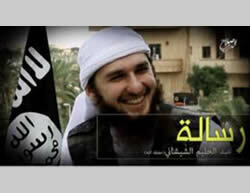 On December 17, 2014, ISIS’s department of information in the province of Salah al-Din, Iraq, released an Arabic-language video showing a Chechen fighter known as Abd al-Halim the Chechen, calling on all Muslims living in the West, and especially Chechens,, to carry out attacks in their countries. This is in retaliation for the coalition force’s operation against ISIS. Abd al-Halim the Chechen also warned US President Barack Obama that hundreds of Chechens would raid the streets of Western countries (ISIS’s information department in the province of Salah al-Din, December 17, 2014). There are several hundred Chechen fighters in Syria, some of them affiliated with the Caucasian Emirate, a Caucasian framework that maintains ties with Al-Qaeda and the global jihad. They include highly motivated fighters with combat experience who participated in the uprising against Russia in the 1990s. 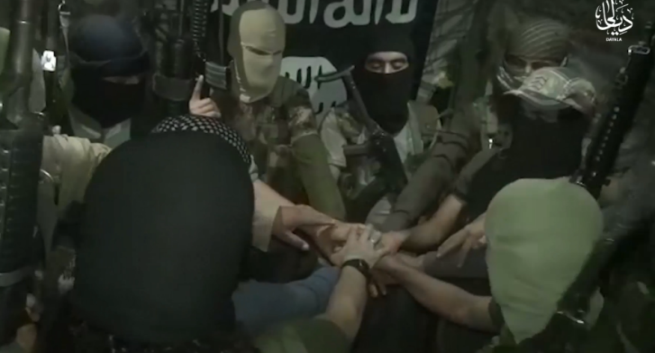 Most of the Chechen operatives joined the Al-Nusra Front and ISIS. Several of them attained senior command ranks and some senior commanders were killed in battle. A large portion of the Chechen operatives fight in a separate military framework by the name of The Army of Emigrants and Supporters. Some of the operatives in that framework, including senior officers, left the Al-Nusra Front following the rift and joined the ranks of ISIS. According to Chinese newspaper Global Times, about 300 Chinese are fighting in Iraq and Syria in the ranks of ISIS. In China, this has given rise to fear of the security risk inherent in these operatives after they return to their country. China has expressed concern in view of the threat of those fighters on security in the Xinjiang province (known as East Turkestan) in western China, the residence of the Uyghur minority. The first report stating that fighters from China had joined the fighting in Syria appeared in the second half of 2013. 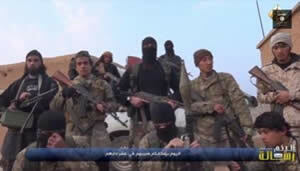 The report, published in China, stated that Uyghur Muslim separatists have been traveling to Syria since May 2012 in order to join in the fighting alongside global jihad operatives. Like other countries, this phenomenon has grown in the past year in China as well. The Muslim separatists in China belong to the Uyghur people, living in the autonomous region of Xinjiang in northwestern China (sometimes called East Turkestan by the separatists). The Uyghurs, at least in part, strive for independence and in the 1990s their uprising was suppressed by the Chinese authorities. In July 2009, violent riots broke out between the Uyghurs and another ethnic group, the Han people. Spain's interior minister announced that counterterrorist activities carried out by the police forces of Spain and Morocco led to the arrest of seven people for allegedly recruiting women to go to Syria and Iraq to support ISIS. The seven were charged with setting up a network for locating, recruiting and sending women to Syria and Iraq (Dailystar.com.lb, December 16, 2014). Danish authorities have detained two young men who expressed sympathy and solidarity with ISIS. One of them is a 21-year-old of Syrian descent, who was detained on December 18, 2014, after distributing a video calling for the murder of citizens of the countries taking part in the coalition against ISIS. The other is 26, and has been charged with incitement (to terrorism) (Al-Arabi Al-Jadeed, December 20, 2014). There are several dozen Salafist-jihadi operatives from the Gaza Strip in Syria, operating as part of an ISIS unit named after Sheikh Abu Nur al-Maqdisi. 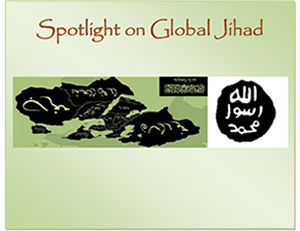 For further information, see the ITIC’s Information Bulletin from October 1, 2009: "The struggle between Hamas and the jihadi-Salafist networks in the Gaza Strip affiliated with the global jihad."